[Tokyo, Japan] This is kind of love at first taste. It was December’s winter in Tokyo, where I found your teeth chattering, and going around searching for warmth. Strangely, I was not looking for ramen and the likes, but soup. Real good comforting soup. 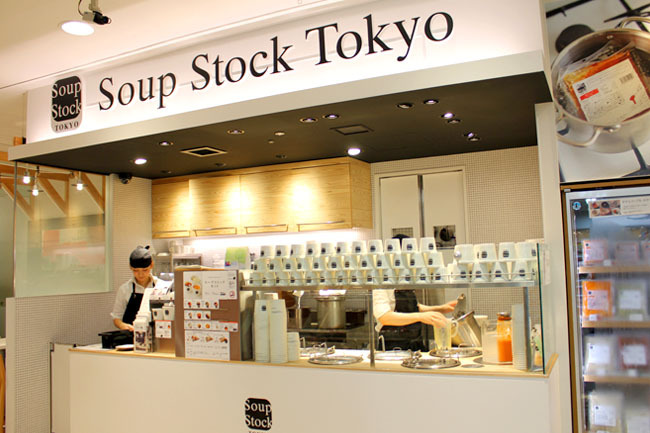 Then I found Soup Stock Tokyo. And every time I went back to Tokyo, I make it a point to have two cups each visit. Yes two cups. 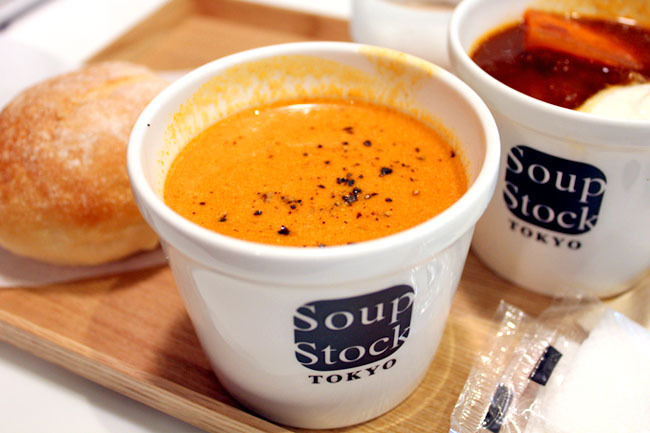 Unlike most other conventional soup kiosks and restaurants, Soup Stock Tokyo offers a Half-and-Half soups with gohan (rice) or bread at 900 yen (SGD$10.90). They come in stylish contemporary white mug-shaped bowls, presented with a wooden tray for an earthy feeling. There is something about these Japanese shops. You just feel a sense of happiness, peace, and calmness where dining there. Even though Shinjuku is the buzzling commercial district where people dine and go, everything is so clean, white and organised. The décor also reminds me of Café Muji, the place you watch the Tokyoites go by. My recommendations? The Tokyo Borsh and Hokkaido Crab Bisque. 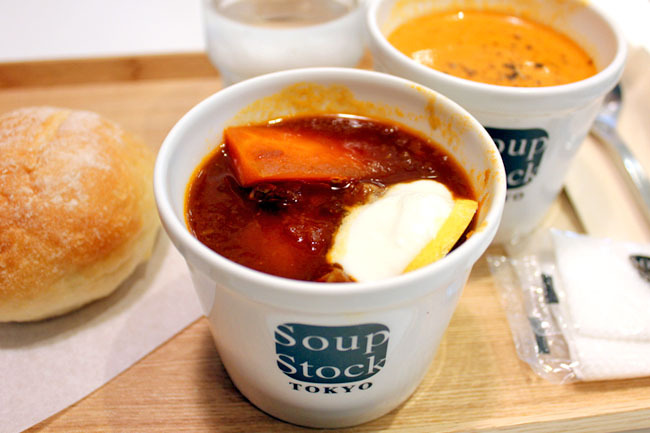 Compared to Eastern European’s borsh soups which are typically rustic and thick, Soup Stock Tokyo’s still does it the old-fashioned way with caramelized onions and brown tender beef, but with a brighter lighter soupier touch. 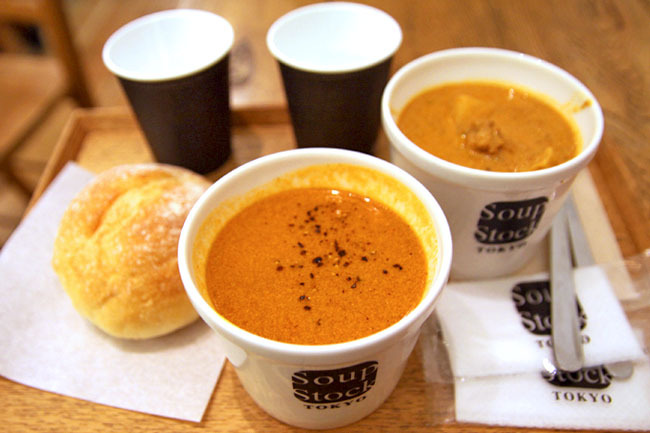 The Hokkaido Crab Bisque is the classic soup to dip your breads in, thick and creamy with the unique seafood twang. You can try just holding the cup with both hands, taking graceful sips, and counting your blessings. 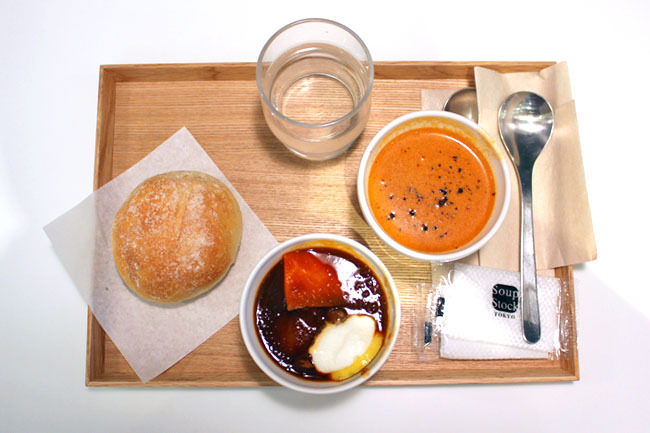 The other popular soup choices are Hokkaido Pumpkin Potage, Van Gogh’s Onion Soup, Italian Tomato Minestrone, Tomato Stew with Chicken and Vegetable and Prawn French Curry. There are 60 branches in Tokyo, and 1 in Singapore at Asia Square Tower 2. I wished so much to have it in Singapore. When it finally came, I was afraid it would lose its magic away. We will find out. Uwah, I saw it too but I didn’t get to try it.